﻿ Do you know Apple still hides something from you? At I0507, May 28th - June 1th Be there or be square! Do you know Apple still hides something from you? Recently, Apple gets caught up in “iPhone Slow Down Drama. “ Recently, 380 thousand Korean customers filed a class-action lawsuit against Apple, and the number of signature is still growing. However, we know more than that about Apple. Since Apple joined WPC, the whole electronic industry has witnessed a rapid growth ofwireless charging. Even Samsung had to admit that Apple has a much stronger driving power than itself, even if Samsung started addressing this industry much earlier. Does Apple only open to Mophie and Belkin? As a captainof wireless charging, from the beginning, Samsung supports the wirelesscharging technology from 5W to 10W fast charging, step by step. 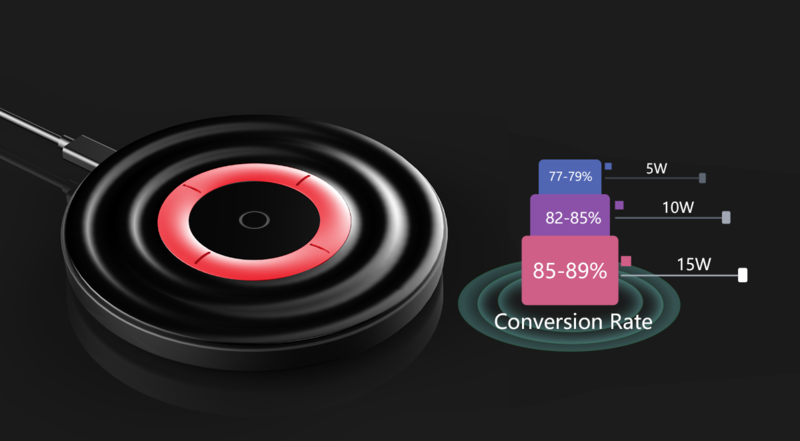 At present,most smart phones claim to support wireless charging, however, those smartphones are only equipped with a 5W receiver (RX). Therefore, in fact, theycannot achieve fast recharging, even with high power chargers (TX). What'smore, if TX cannot pass FOD, or without temperature control and circuitprotection, it will result in both TX & RX burning out becauseof skyrocketing temperature and frequency out of track. Apple joined WPC as an absolute trooper, and further upgraded to a regular Member at WPC, which represents Apple's wireless charging plan is far more than just these three phones, Phone X/8/8 Plus. However, Apple only released the 5W charging, which follows standard Qi standard. 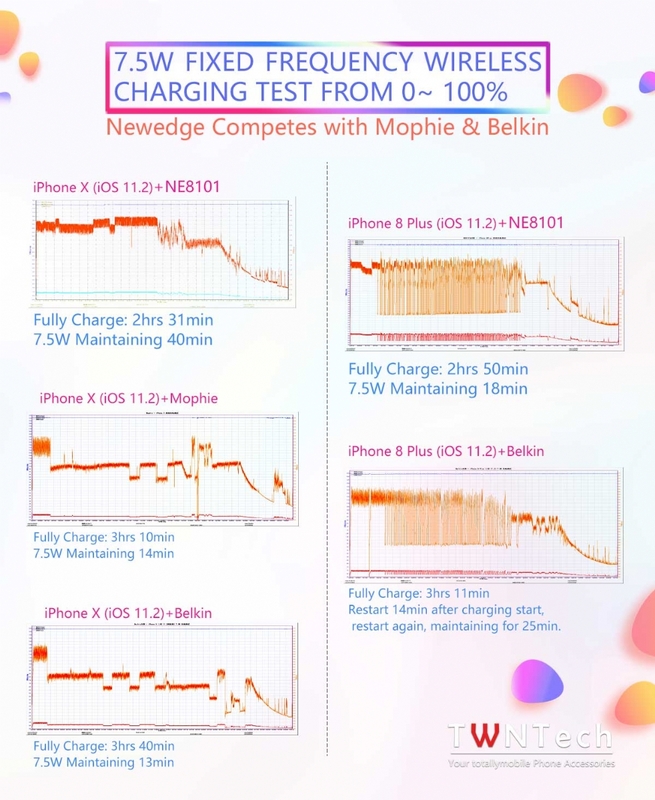 Apple released its 7.5W fixed frequency fast charging only to NXP, whose chip has been used by Mophie and Belkin, Apple’s original accessory supplier. And even with fast charging solutions, their products can only maintain at the fast charging state for 13 minutes. As a result, the new iPhone wireless charging is not efficient at all in real life. iPhone X only takes 2 hours and 10 minutes from 0%~96%? TWNTech's TWNT-WC1001Y, however, with built-inNewedge’s NE8101 SOC , can not only realize Apple 7.5W fixed frequency fast charging, but also shorten the charging time by nearly 1 hour for iPhone X,with iOS 11.2 version, compared to Apple's original solution. In fact, what plays an important role is NE8101 to realize high efficient 7.5W fixed frequency charging. Apple’s original accessories from Belkin and Mophie can only maintain for 13minutes at 7.5W fixed frequency fast charging, but NE8101 of Newedge can last for 40 minutes! In addition,in Mophie and Belkin solutions, iPhone will initiate iOS 11.2 self-protection mechanism, due to temperature increase, along with charging breakdown. Therefore, due to its prefect temperature control, NE8101 can maintain high efficiency during fixed-frequency, avoiding charging breakdown. What's more, Newedge has proved that, NE8101 only takes 2hrs 10 min to charge for iPhone X from 0%~96%, only takes 2hrs 31 min to fully charge. Is 5W Apple wireless charging useless ? In fact, currently, Samsung and Apple are the only two smart phone manufacturers that implement fast-charging mechanisms. Samsungis 10W with variable frequencies, while Apple is 7.5W at afixed frequency. As for other brands, those smart phone are only equippedwith a 5W receiver (RX). Confined by 5W power, charging speed is limited. In order to improve the user experience,charging convert rate must be increased. Newedge is only and the first fund professional chip designer for wireless charging, with wafer provided by TSMC foundry services, and chip packaging & testing provided by ASE Group, which makes unparalleled IC quality in the domestic industry. Unlike other domestic chip factories, outsourcing MCU to assemble, because of no capability of chipset design, Newedge used the same SOC structure, as foreign leading IC manufacturers, like IDT, TI, NXP. This is a fundamental reason for breaking limitations of efficiency and temperature control of wireless charging. 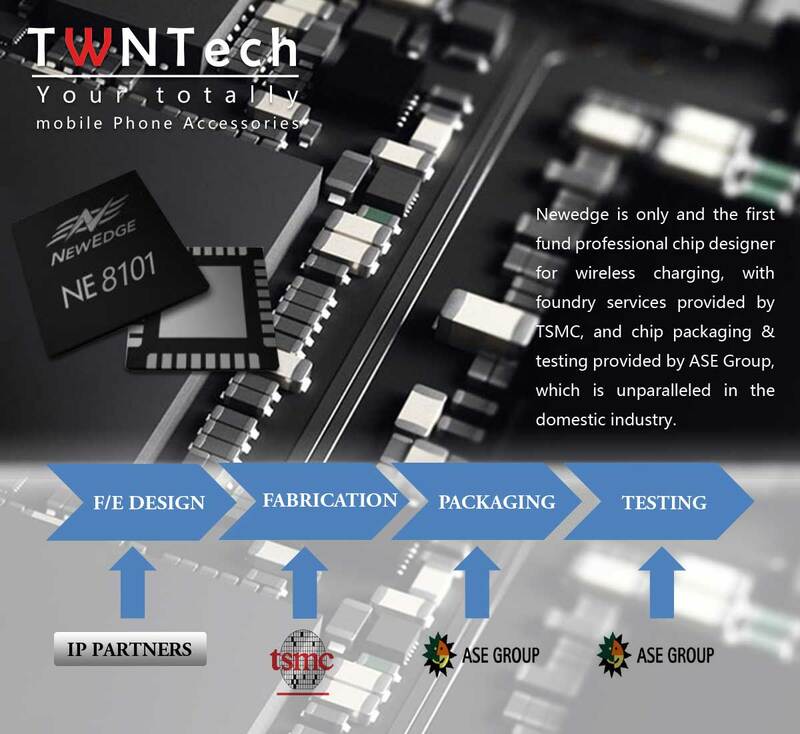 We, TWNTech, are very confident that with Newedge chips, our 5W conversion rate can be precisely controlled between 77-79%; 10W fastcharge can reach 82% -85%; and at 15W high power, it can be 85-89%! 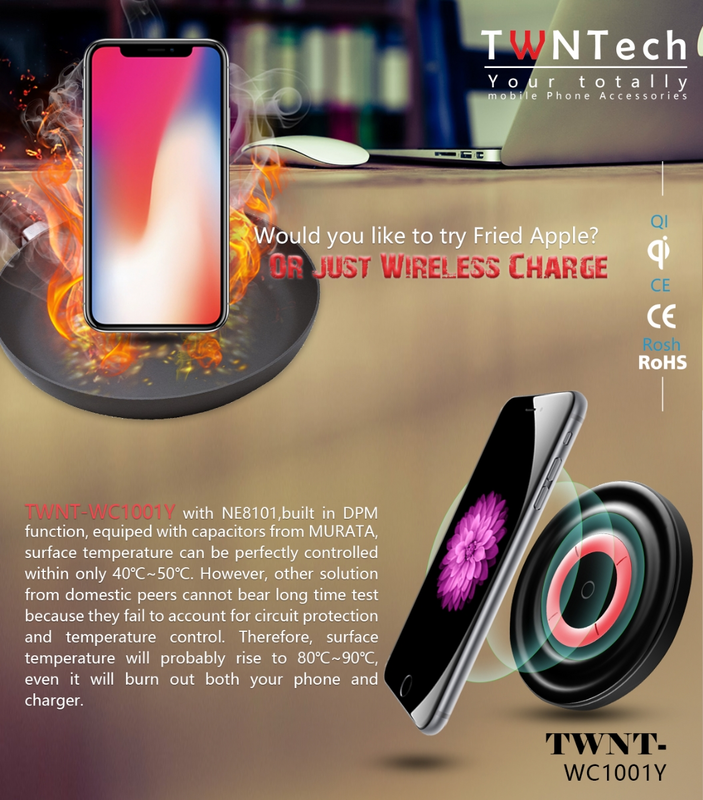 TWNT-WC1001Y can simultaneously support three ways, no matterordinary 5W, or 7.5W fast fixed frequency for Apple, even 10W fast charge forSamsung, our performance is leading the whole industry, the most importantthing is, and TWNTech has already applied Qicertification for it! What are you hesitating about? Both Support 10W Fast Charge for Sumsung & 7.5W Fast Charge for iPhone(iOS 11.2). Touch panel earbuds to control volume. Important: All the content relating to products, services and events are designed by TWNTech.All images are copyrighted to TWNTech owners.Information presented on this website is considered public information (unless otherwise noted) and may be distributed or copied. Lianfeng Road,Dali Industrial Area, Qingxi Town, Dongguan, China.